The present invention discloses a process for charging directly a redox flow battery from the sunlight, through chemical conversion, with very high thermodynamic efficiencies. It also relates to a solar rechargeable redox flow cell and its operation. 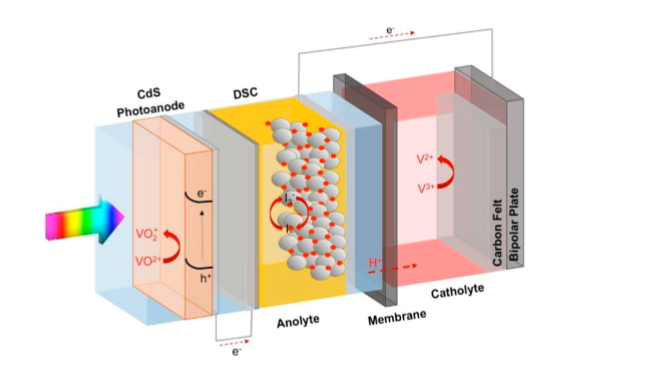 This process can be described as the use of photoelectrodes which absorb sunlight and upgrade electrolytes to their charged electrochemical form. This technology will materialize in a device for charging the redox flow battery directly from sunlight, with a high level of efficiency. The present invention discloses a process for charging directly a redox flow battery from the sunlight, through chemical conversion, with very high thermodynamic efficiencies. It also relates to a solar rechargeable redox flow cell and its operation. This process can be described as the use of photoelectrodes which absorb sunlight and upgrade electrolytes to their charged electrochemical form. This technology will materialize in a device for charging the redox flow battery directly from sunlight, with a high level of efficiency. The technology (and resulting device) presented allows, for the first time, the charging of a redox flow battery directly from sunlight. Not only that, but the process ensures a high level of thermodynamic efficiency (of 40%). This technology is of interest to redox-flow battery manufacturers and solar panel manufacturers. For redox-flow battery manufacturers the technology could be licensed if these companies want to develop their own device or cooperation in R&D can be achieved to develop a new redox flow battery solution with this technology embedded. For Solar panel manufacturers this could be a move to expand their market and to create a device to recharge redox flow batteries, allowing these companies to incorporate these batteries in their solutions for superior product/service combinations.